With the turtle and tortoise gallery area of our web site we are doing some things that are quite unique for the internet. Because of the complexity of this, the area will be under fairly constant construction for the foreseeable future. Visit often and watch it develop. It is our intention to offer the highest quality photos that we can acquire. We intend to offer the galleries in two versions, grouped by Genus via taxonomic designation: Galleries by Genus and also offered in galleries defined by geographic location. Galleries by Geography All photos will be thumbnailed but because of the number of species that will by necessity be in some galleries please be aware that they may load slowly. The ones tagged with the photographer's name (if applicable) and "World Chelonian Trust" or www.chelonia.org have originated with us or through us. Anyone wishing to use these should make this request of the World Chelonian Trust with the link provided. If you have pictures of species that are still lacking from our galleries we would be pleased to have the opportunity to present them here in this manner. The photographs tagged with the photographer's name (if applicable) and "Tortoise Reserve" are on loan in a low resolution format for these galleries as a part of our Cooperative Agreement with the Tortoise Reserve. 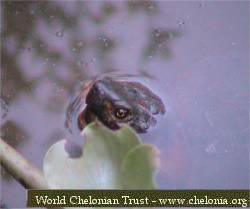 Click here for information about the Tortoise Reserve / World Chelonian Trust Agreement. The Tortoise Reserve maintains a collection of chelonian slides. Their goal is to obtain images of all described taxa, including photographs of males, females, hatchlings, behavior and habitats. At this time they have over 13,000 catalogued slides representing about 70% of the world's species. The Turtle Survival Alliance is A Joint Initiative of the IUCN/SSC Tortoise and Freshwater Turtle and Conservation Breeding Specialist Groups . Briefly this web space was loaned to the Alliance prior to their preferred URL becoming available.